Two truly unique events have transpired over the past week in Turkish politics, which has been otherwise marked by arrests, investigations, dismissals, resignations, an assassination, and a call, from within the party, for Erdoğan to resign. The first unique event is Gülen’s heretofore unprecedented diatribe. The second is the AKP’s outright implication of the U.S. in the events of the last week (e.g., from today). The “facts” are now widely available in your favorite newspaper, so I won’t go into detail. Here’s a good executive summary. And here’s a chart worth watching in the coming months. 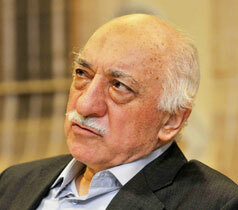 Countless websites sing the praises of Fethullah Gülen. Some of them take out ads. I have, of late, begun to realize the absurdity of authoring a blog on Turkish politics, religion, and culture without significant attention (save an ominous reference) to what I will call the “Gülen movement” (sometimes called the Hizmet [service] movement). From what I understand, Gülenism—a questionably apolitical movement within the Sufi strand of Islam—is the paradigmatic expression of Anatolian Islam. Though it has a distinctly Turkish pedigree, with roots in the late Ottoman Nur (Light) movement of Said Nursî (1878–1960), it by no means limits itself geographically. The movement has become notable more recently for its support of non-religious as well as religious education through an international school system, and an overarching attitude of tolerance—especially toward other religions. Muhammad Fethullah Gülen, after whom the movement is named, is an adequately interesting character to lead what has become a globally significant phenomenon. Born in 1941 near Erzurum, Gülen seems to have been a largely self-taught scholar, knowledgeable in subjects ranging from Qur’anic exegesis to Western existentialism. After a long preaching career in Turkey, which was met with great success since the ’80s (when Islam was seen by the state as a tool to fight socialism), Gülen eventually fled to Pennsylvania, of all places, in 1999. The overt reason for his flight was a legitimate fear of arrest for challenging the “secular nature” of the state. … a charismatic preacher who leads one of the most influential Islamic movements in the world, with millions of followers and schools in 140 countries. He has long advocated tolerance, peace and interfaith dialogue, drawing on the traditions of Sufism, a mystical strain of Islam generally viewed as being moderate. But this is where the concerns spring up. With a network of media outlets, millions of dedicated followers, a vast associated system of private schools, and the simple fact that most people have never heard of the movement, the Gülenists—to those who have heard of them—face some well-deserved suspicion.